Archaeologists have made a remarkable discovery at Gebel el Silsila, a historic quarry site near Aswan on the River Nile, - a sacred temple used for four epochs of ancient Egyptian history spanning more than 1,500 years. The large temple was built during the New Kingdom from 1550 BC during the Tuthmosis I era, and was used during the kingships of Amenhotep III and Ramses II through the Roman era. 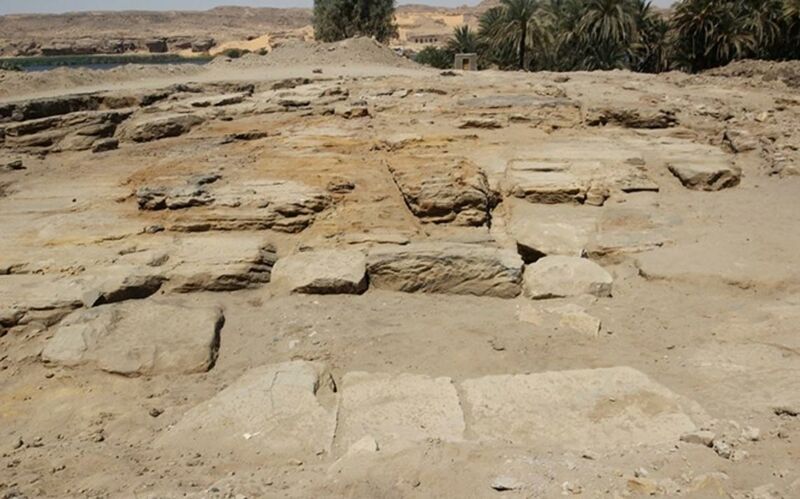 Ahram Online reported that the ruins of the newly-discovered temple measure 35.2 meters (115.5 feet) by 18.2 meters (59.7 feet). It had four layers and external and internal walls. The western side of the temple grounds has traces of five huge columns. Part of a column of the temple. Credit: The Gebel Silsila Survey Project 2015. Maria Nelson, head of the Swedish mission that is doing the excavations with Egyptians, said work started in 2012. Then the team discovered fragments of seals or cartouches of kings Amenhotep III and Ramses II. They also found sandstone painted with depictions of skies and sparkling stars. A cartouche, or the seal of a king, found near the temple in Aswan. Credit: The Gebel Silsila Survey Project 2015. The site, known in ancient times as Khenu (the Place of Rowing), is 65 km (40 miles) north of Aswan. It on the east and west sides of the Nile at the narrowest point of the river. It is known for its impressive stelae and cenotaphs, and has many types of ancient graffiti, including inscriptions made in hieroglyphics, hieratic, demotic and also Greek and Latin. The site has petroglyphs and elaborate pictographs, as well as painted and carved art from prehistory through to many later periods. Egyptian Minister of Antiquities Mamdouh El-Damaty called the find very important. The site of Gebel el Silsila had been largely untouched in modern times, though it has been visited a lot, since Napoleonic researches went there in the early 19 th century. Two archaeologists did minor excavations in the late 19 th century and another did work in the early 20 th century. The work that is now underway took up where R.A. Caminos’ work of the early 20 th century left off. The present-day archaeologists are doing a comprehensive survey and are trying to document the site’s less spectacular features, says the website of The American Research Center in Egypt (ARCE). Graffiti recorded in 2015 included a winged solar disc adorned with uraei and with demotic texts in white that show dedication to Isis. These particular inscriptions also have information about work being done in the quarry during an unnamed Caesar of Rome. Archaeologists have found artifacts and also 54 stone huts that they believe the quarry workers lived in. Excavation at the new temple site still continues. Featured image: A general overview of the temple. Credit: The Gebel Silsila Survey Project 2015.